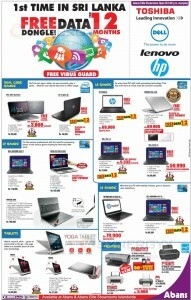 Abans announces special promotions for the Dell / HP/ Lenovo/ Acer Laptops and Personal Computer. 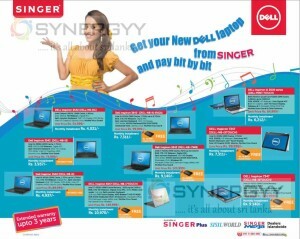 Dell, HP and Lenovo Laptops are offered a special discounted price with 4 Years warranty. EPSI Technology and JKOA an authorized distributors for Asus laptops, Notebook in Sri Lanka announces a special promotion for Asus X555LA-XX622D 90NB0652-M09100 model for Rs. 77,000.00. For more detail about the promotions and special prices contact to authorized distributor on below contact numbers. 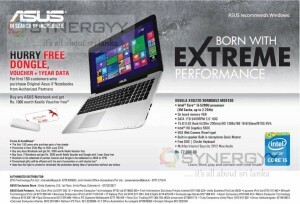 Or see below image for more detail and Asus gold partners’ islandwide. e-wis offers a range of All-in-One PC, Desktop & Laptop with Intel Inside at an affordable price of Rs. 46,000.00 upwards. No: 39, St Michele’s Road, Colombo 03. Factory. Hathpaha Junction, Samajasewapura, Sooriyawewa, Hambanthota. 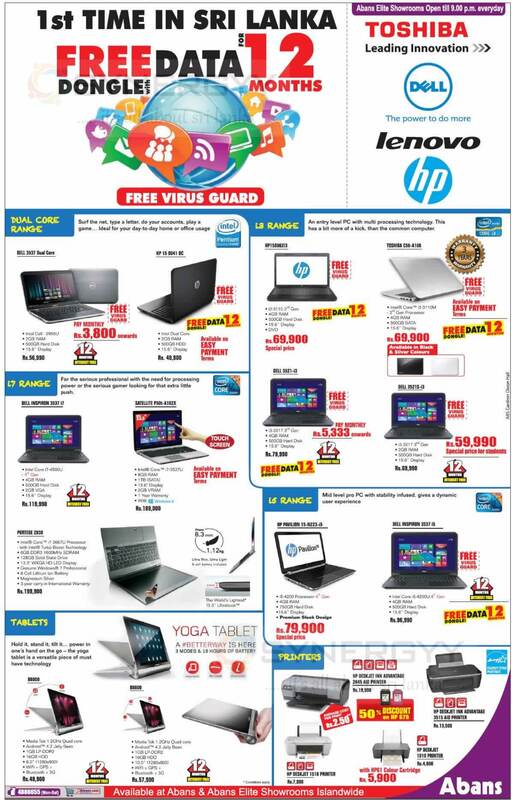 Abans offers very special price for the HP laptops in this season, purchases an HP laptops from Abans Elite and enjoy a Free Dongle with Data for 12 Months with Free Virus Guard. 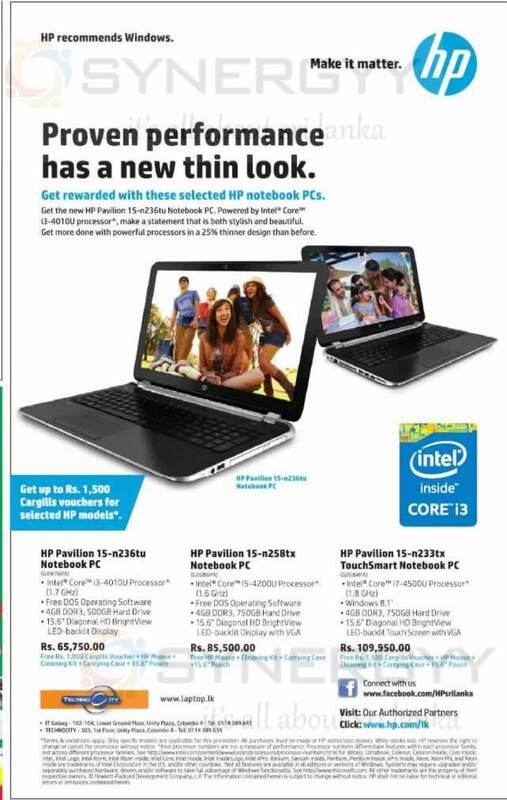 Proven performance has a new thin look and Get rewarded with these selected HP notebook PCs. Get the new HP Pavilion 15-n236tu Notebook PC. Powered by Intel Core i3-401OU processor, make a statement that is both stylish and beautiful. Get more done with powerful processors in a 25% thinner design than before. Stay on top of life when you power up quickly with the new HP2000-2d29tu Notebook PC. 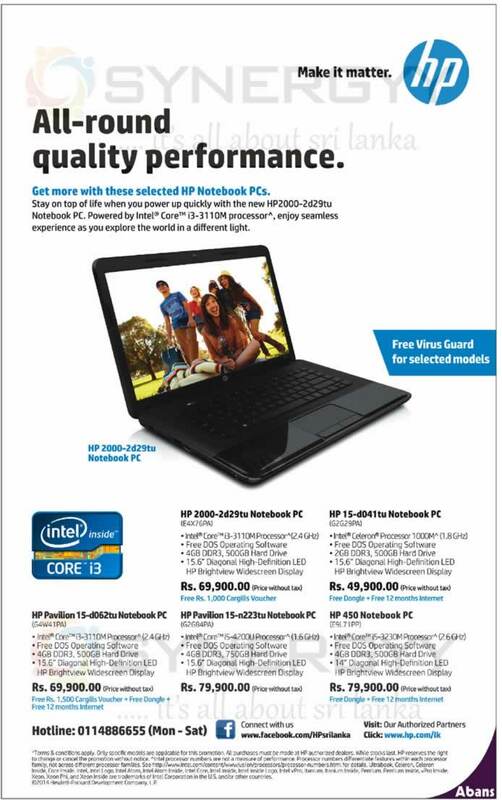 Powered by Intel® Core™ i3-3110M processor , enjoy seamless experience as you explore the world in a different light. 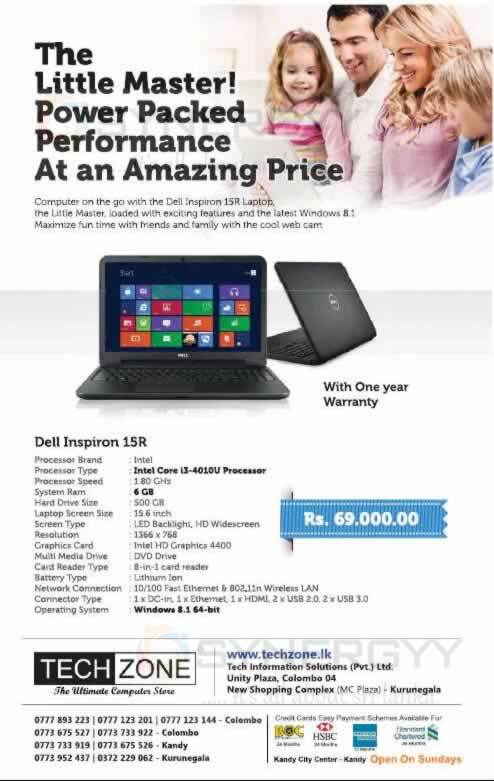 Softlogic Srilanka offers Dell Inspiron 3521 Core i3 for Rs. 79,990.00 or Rs. 4,999.00 monthly instalment with 13 Months interest free scheme. Abans Srilanka offers you a Apple branded MacBook at an best price in the country. Apple MacBook Pro is for Rs. 165,990.00 or Monthly instalment of Rs. 8,082.00. Interests free 24 Month instalments are valid for credit cards. 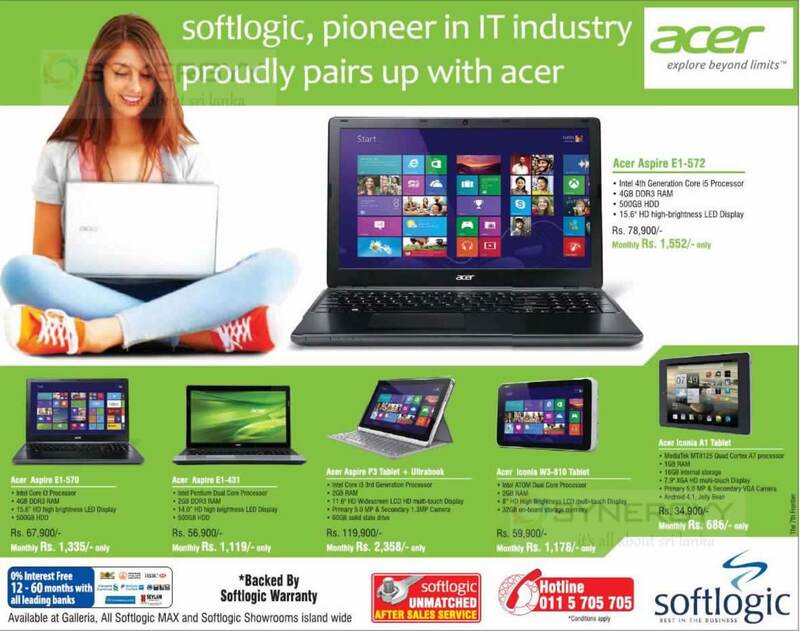 Softlogic is an authorised reseller of Acer laptops and tablets in Srilanka, Softlogic a special price along with monthly instalment scheme for Acer Laptop and Tablets. 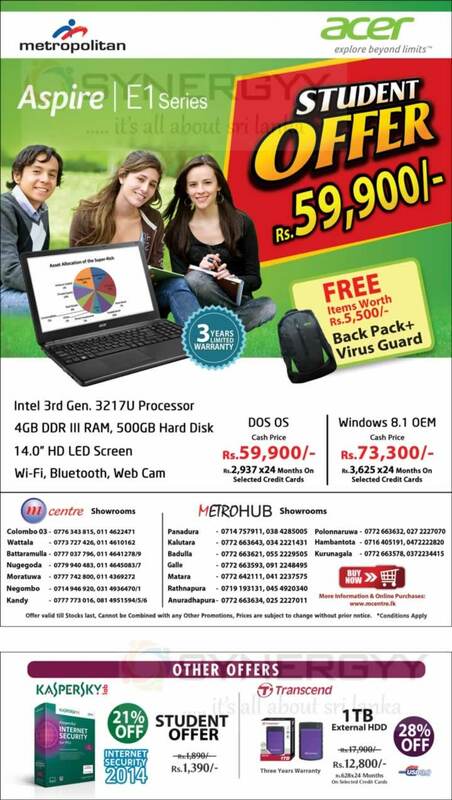 The Metropolitan announces a special promotion of Acer Aspire E1 series Laptop at a best price for students; this price is applicable only for students. Laptop, Notebook, Tablet PC and Tablets are becomes essential items to modern Human life, as a human habit; we looks forward a better features at a less prices as a value for cost concept. 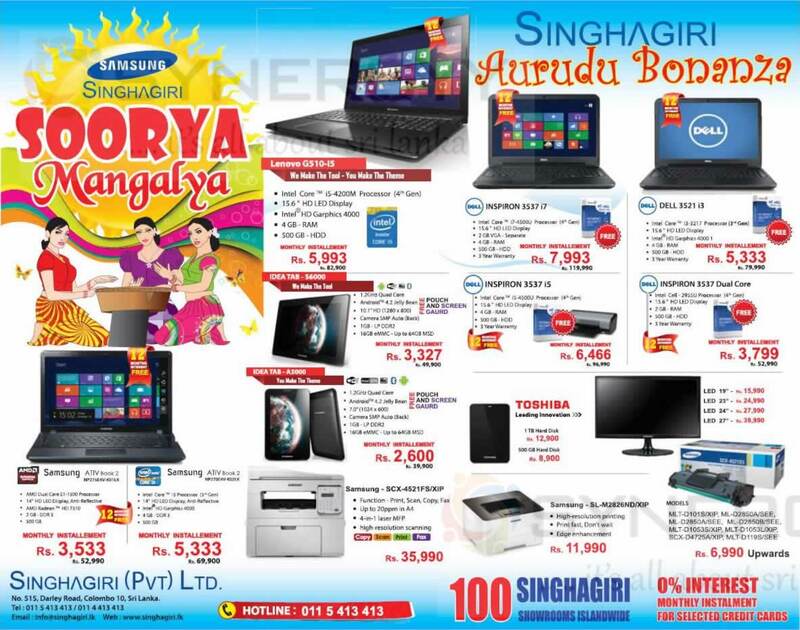 Here are few Main branded Laptop, Notebook, Tablet PC and Tablets prices and features attached for your easy reference. 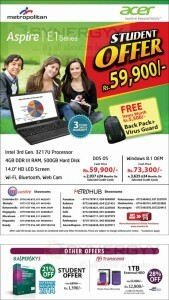 The Tech Zone offers its best price for the Dell Inspiron 15R for Rs. 69,000/-, the offer brings your an Intel Core i3 Processors 500GB card drive 15.6 Inches laptop to your. 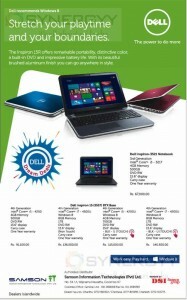 This would be a best offer for you to obtain the Dell Inspiron 15R with 1 year warranty at this price from Tech Zone. Tech Information Solutions (Pvt.) Ltd.
Metropolitan offers Acer Aspire V5 – 573G-i7 for Rs. 149,900.00 for your need of esteem need of gaming. 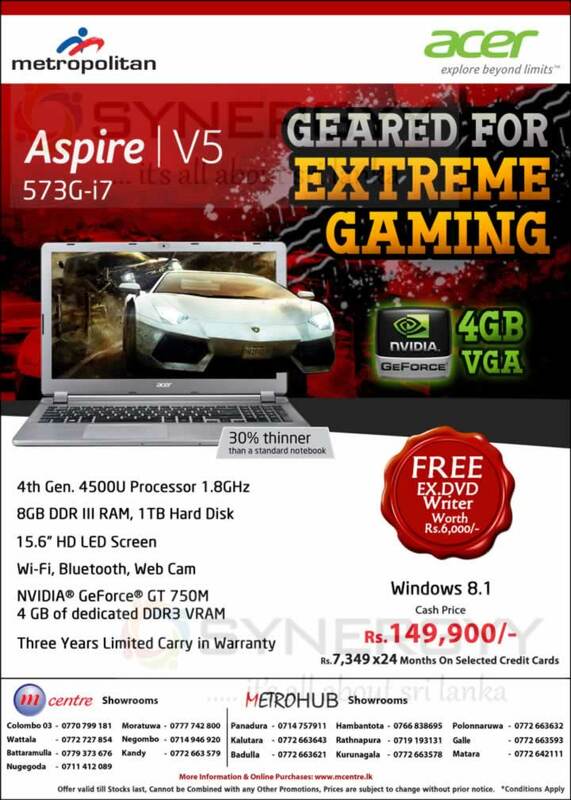 Buy your Acer Aspire V5 – 573G-i7 with Three Years Limited Carry in Warranty with Windows 8.1 operating system for Rs.149,900/- or Rs. 7,349 x24 Months On Selected Credit Cards. 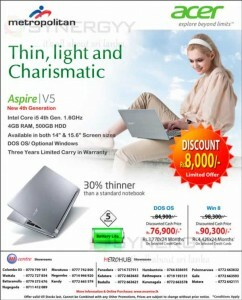 The metropolitan offers Aspire V5 4th Generation Notebook for Rs. 76,900.00 with Dos Operating system and Rs. 90,300.00 with Windows Operating system. 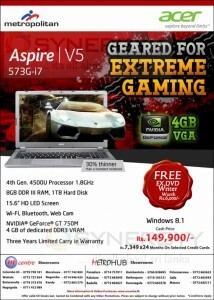 Aspire V5 with DOS OS is Rs.76,900/- or made monthly instalment of Rs.3,770×24 Months On Selected Credit Card. And enjoy Window 8 with Aspire V5 for Rs. 90,300/- or made monthly instalment of Rs.4,426×24 Months On Selected Credit Card. Don’t be duped into buying cheap computers of unknown brands. 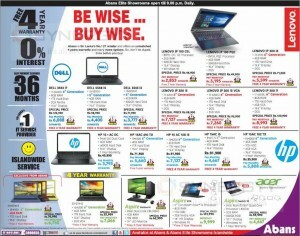 Abans have the widest range of computers from the world’s best brands for trouble free performance year after year. 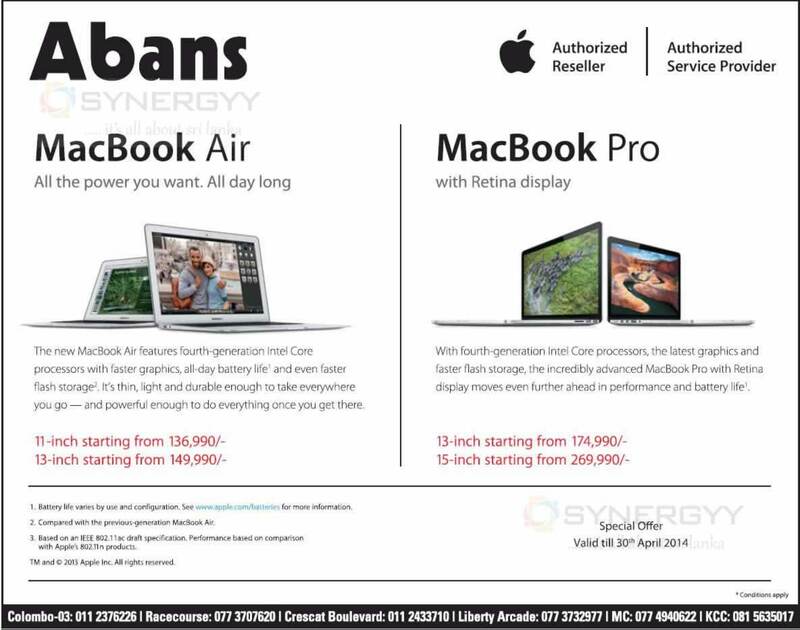 The promotions are subject to change, therefore see below image for more information or call Abans on 011 4886655 before purchase it. 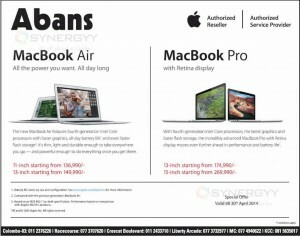 The new MacBook Air features fourth generation Intel Core processors with faster graphics, all-cay battery life and even faster flash storage. 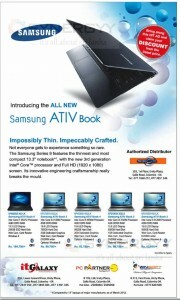 It’s thin, light and durable enough to take everywhere you go — and powerful enough to do everything once you get there. MacBook Pro with Retina display with fourth-generation Intel Core processors, the latest graphics and faster flash storage, the incredibly advanced MacBook Pro with Retina display moves even further ahead in performance and battery life. 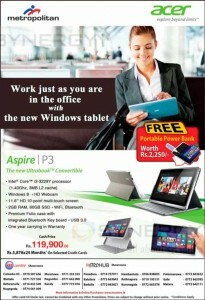 Metropolitan introduce the Acer Aspire P3 Windows Tablet in Srilanka for Rs. 119,900.00, the windows tablet is well suits to quick usage of your personal works at any given short periods. These Acer Aspire P3 Windows Tablet are much convinces for the working professionals and those who wish to used their time effectively. The special Cash Price is Rs. 119,900 00 or purchases at a monthly instalment of Rs.5,878×24 Months On Selected Credit Cards. 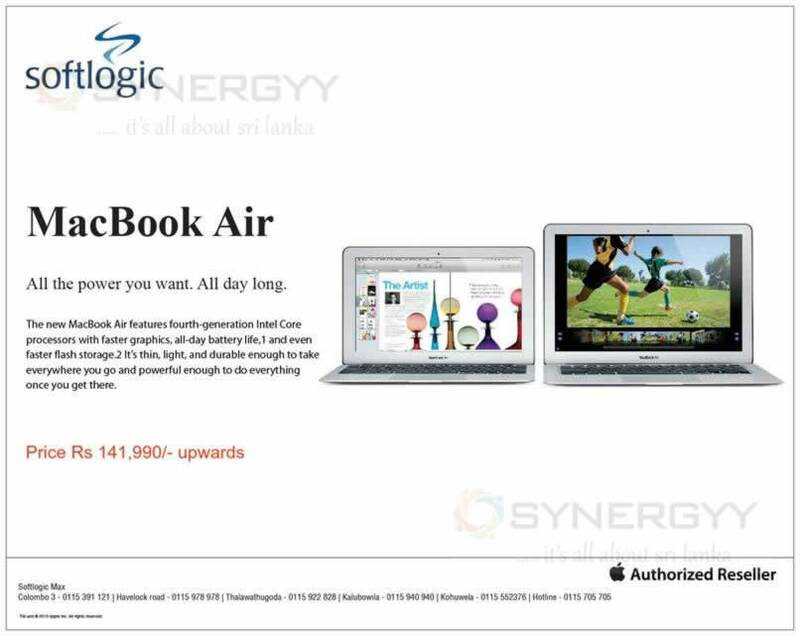 Softlogic an authorized Reseller for Apple MacBooks and iMac, offer a special price for Apple MacBook Air as Rs. 141,990.00. 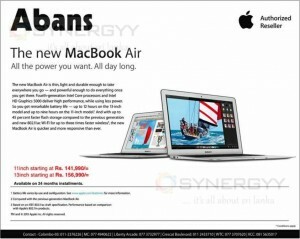 The new MacBook Air features fourth-generation Intel Core processors with faster graphics, all-day battery life. l and even faster flash storage^ It’s thin, light, and durable enough to take everywhere you go and powerful enough to do everything once you get there. 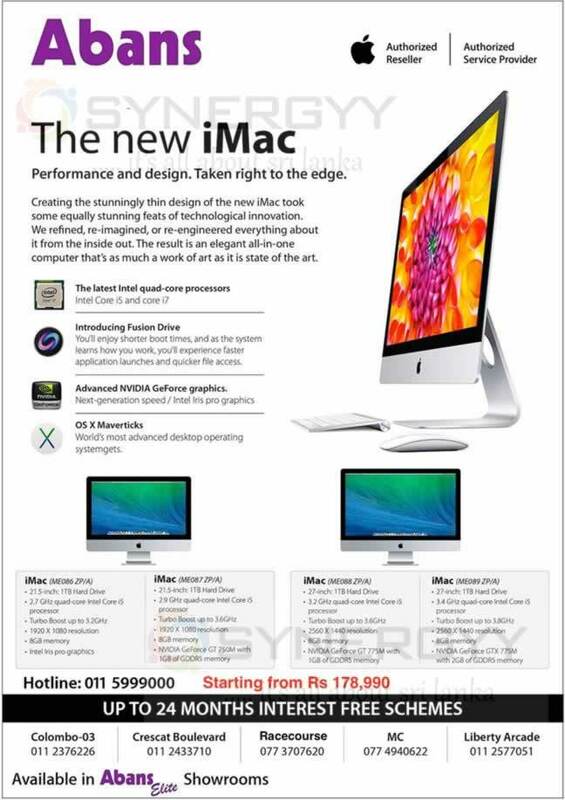 Abans elite offers the prime branded Apple iMac PCs in Srilanka, Apple iMac is a performance and design taken right to the edge. 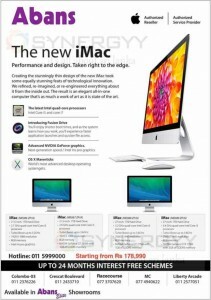 Creating the stunningly thin design of the new iMac took some equally stunning feats of technological innovation. We refined, re-imagined, or re-engineered everything about it from the inside out. The result is an elegant all-in-one computer that’s as much a work of art as it is state of the art. Introducing Fusion Drive; you’ll enjoy shorter boot times, and as the system learns how you work, you’ll experience faster application launches and quicker file access. OS X Maverticks; World’s most advanced desktop operating systemgets. Stretch your playtime and your boundaries. 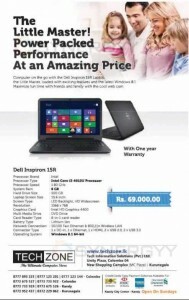 The Inspiron 15R offers remarkable portability, distinctive colour, a built-in DVD and impressive battery life. With its beautiful brushed aluminium finish you can go anywhere in style. 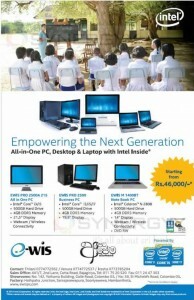 Authorized Distributer: Samson Information Technologies (Pvt) Ltd.
No 34/A Wijerama Mawatha, Colombo 07. 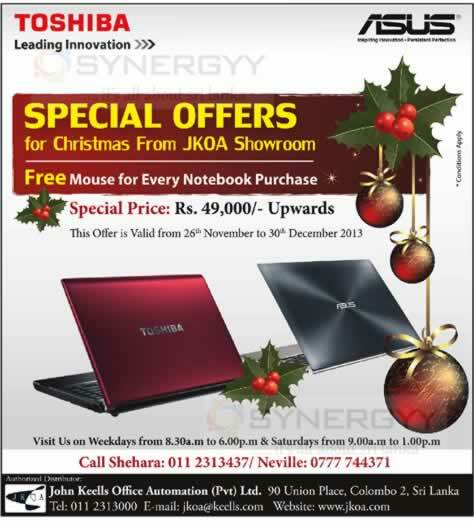 The John Keells Office Automation (Pvt) Ltd announces a special offers for the Christmas 2013, the offer brings your with Toshiba laptops from the price of Rs. 49,000.00 upwards. 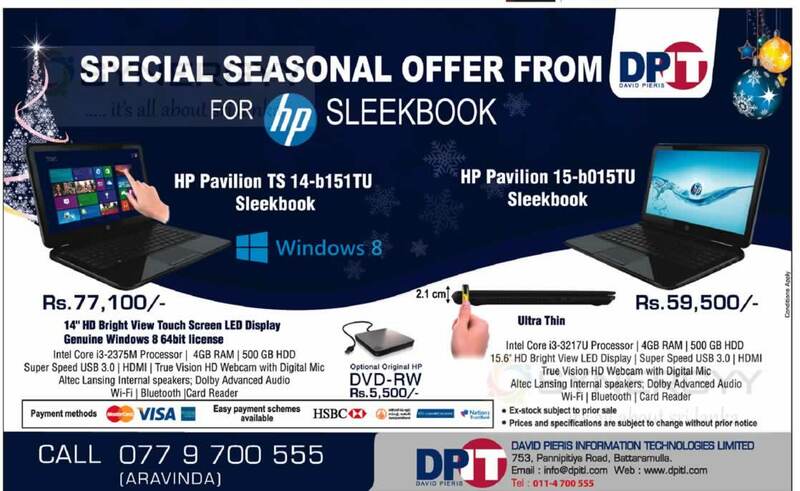 David Pieris Information Technologies Limited offers you HP Pavilion Sleekbook in Sri Lanka at special prices for this Christmas season. The new MacBook Air is thin, light and durable enough to take everywhere you go — and powerful enough to do everything once you get there. Fourth-generation Intel Core processors and Intel HD Graphics 5000 deliver high performance, while using less power. 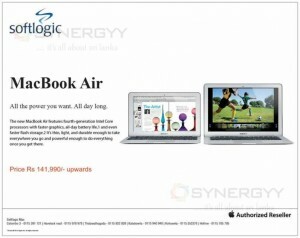 So you get remarkable battery life — up to 12 hours on the 13-inch model and up to nine hours on the 11-inch model. And with up to 45 percent faster flash storage compared to the previous generation and new 802.11 ac Wi-Fi for up to three times faster wireless, the new MacBook Air is quicker and more responsive than ever. 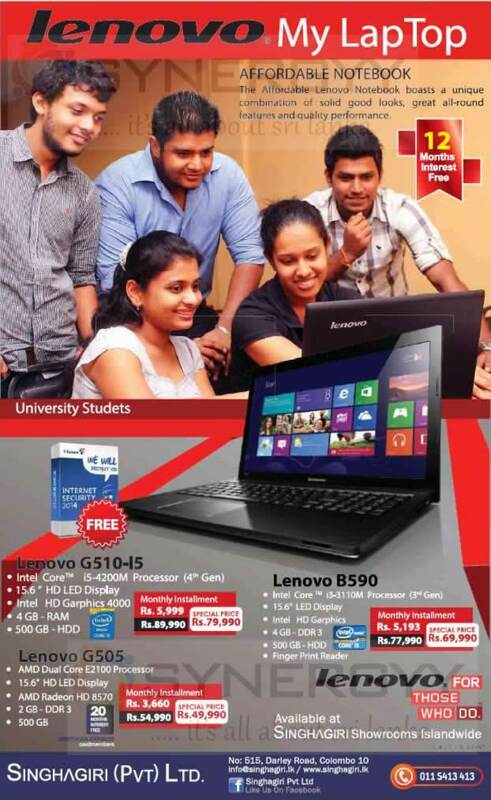 DELL Notebook 3521-i3 is one of the best Laptop in Srilanka at the best prices between Rs. 70,000 to 79,900 ranges. 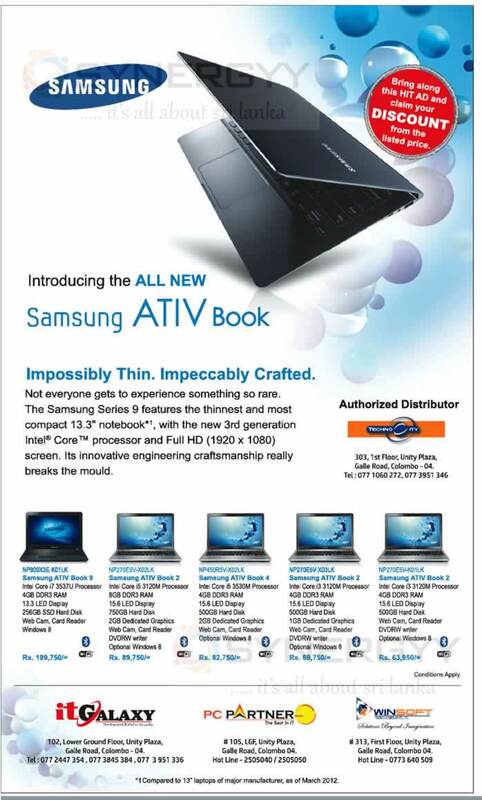 Samsung Sri Lanka is introducing the All New Samsung ATI V Book to Sri Lanka at an Affordable price from Rs. 63,950.00 Upwards. Not everyone gets to experience something so rare. The Samsung Series 9 features the thinnest and most compact 13.3″ notebook*1, with the new 3rd generation Intel® Core™ processor and Full HD (1920 x 1080) screen. Its innovative engineering craftsmanship really breaks the mould. Galle Road, Colombo – 04.